When Taylor and I were back in Massachusetts for Christmas we went out to dinner with my in-laws at a great little restaurant in their town. For our appetizer we ordered the buffalo cauliflower bites and they were awesome. We’ve been talking about them ever since and I decided to take a stab at making my own version. These turned out pretty darn well! Instead of frying them (I’m sure they were deep fried at the restaurant) I baked these in the oven after breading them. They’re spicy, slightly crunchy and perfect when dunked into the herbed tahini dip. We ate these right off the platter after I snapped the photo and there wasn’t a single crumb left. I hope you all enjoy this tasty appetizer as much as we do. Preheat the oven to 425F and line two baking sheets with parchment paper and set aside. Whisk together all the ingredients for the dip in a food processor or small blender. Taste test and adjust seasonings as needed. If the dip seems to thick, add more water to thin until you reach your desired consistency. Place the cauliflower florets on a large platter and keep to the side. In a large bowl stir together the flour, milk, garlic powder and salt. You want a slightly thick mixture that's still moist enough to coat the cauliflower. You can adjust the flour to liquid ratio as needed here. Working in batches toss the cauliflower in the batter to evenly coat it. Place the coated cauliflower on the prepared baking sheets in a single layer. Bake for 20 minutes, flipping halfway. While the cauliflower bakes heat the butter in a small saucepan over medium heat. Once the butter is melted pour in the hot sauce and stir well. Remove from the heat (you don't want the mixture to boil) and keep to the side. Remove the cauliflower from the oven and pour half of the hot sauce mixture over the florets. Flip the cauliflower and pour the remainder of the sauce over the second side. Place the cauliflower back in the oven and bake for an additional 20-25 minutes or until golden and lightly crisp. Serve with the herbed tahini dip and enjoy. 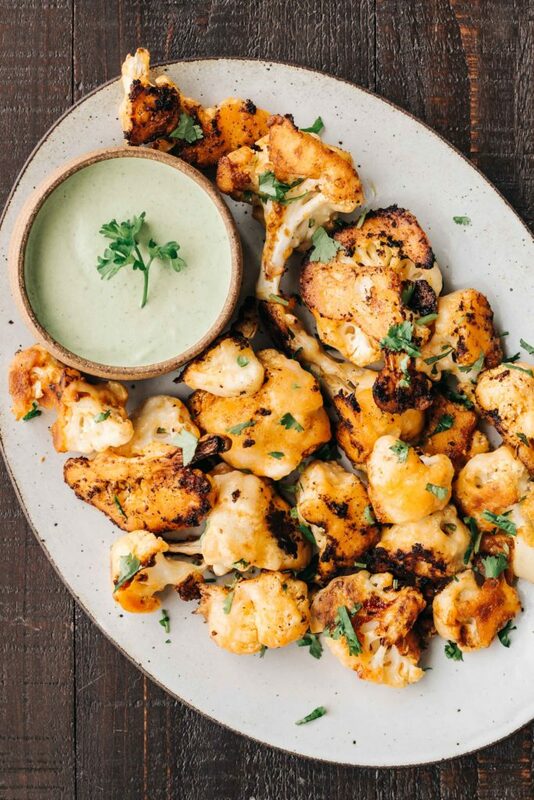 I’ve not yet tried cauliflower bites but myself and the husband both love cauliflower (we can’t find a restaurant in Abu Dhabi that serves them). Never eating chicken wings again…. Added 1/2 an avocado to the sauce and topped the cauli with some parm. this is SO good!!! I have made these twice already and they are delicious! I’m making these for the second time tonight, still getting cauliflower in my farm box mid July!